Living near the coast of Italy, in the town of Pisa, made famous for it's leaning tower, Annalisa Taddei lives with her husband, three daughters and a menagerie of pets. She uses her beautiful surroundings to inspire her one-of-a-kind creations. As a mother, Annalisa wanted to protect her children and didn't want them to grow up influenced by TV advertising and silly programs, so she introduced her children to Disney videotapes instead. "Maybe all the cartoons, maybe my dreams, but now, twenty years later, I cannot imagine teddies not being in the wonder-world I created to protect my children as they were growing up." Working in her "Green Room," a room full of creativity and objects of joy like her bears, gnomes, candles, toys and souvenirs, she stays in touch with all the things that have inspired her. Before discovering bear making, Annalisa created candles and fairy lumbers. Living on the coast, she was able to obtain some of the best sea wood when she walked on the beach or scaled the cliffs to find something special for her creations. While making fairies, elves and gnomes, she would sit by the sea and wait for an inspiration that the sea waves seemed to have provided her. "I didn't know what they would be until I would start working on them." For her, it is exciting to see how her work grows and how far it can actually develop from the original idea it. The same techniques are applied to her teddy bear making. 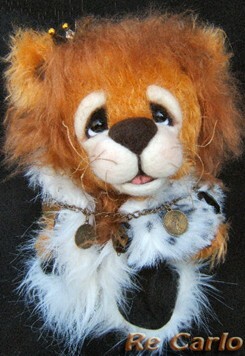 "Sometimes I have an idea that I wish to follow, but I wait for the mohair to "speak" about who the creation will be. The final creation depends more on the process during creation than from the idea it sprouts from." While she is cutting the fur, she gets a feel of the personality about to be born. She has always loved teddy bears and furry friends. Even her daughters have turned into avid collectors; having one hundred or more each in their collections. "I was really stunned when I learned about this marvelous new bear world," she recalled. "I couldn't believe my eyes! There was a dreamy world like that which I didn't know anything about." Curiosity brought her to the web and she surfed to find out more. "In Italy, there is not a teddy bear culture like in other countries, so I had to do intensive searching by myself, through books, materials and the Internet." 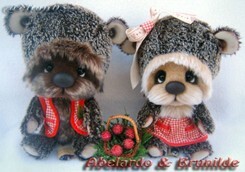 Annalisa bought teddy bears at online auctions before she tried making a bear by herself. She was frightened that she would not be able to make one on her own. But motivated by her wish to have a teddy that she loved, her own teddy bear to kiss, she overcame her fear and started a new adventure. 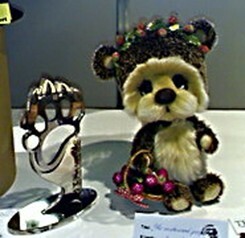 The first bear Annalisa professionally made, she put up for auction. He now lives in the USA. "It was so exciting for me to know that other people liked a bear of mine and were willing to pay for him, that I started to cry." Not only that, but someone on the other side of the world was going to be taking care of her baby. "It was an outstanding feeling!" Her current bear making techniques now include using steel, plastic or glass balls to stuff the bear's tummies. "I think handling these tummies is better than having a stress ball in your hands and it's a lot more fun." Annalisa usually uses polymer clay to form the noses. 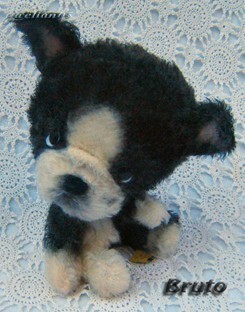 "The most difficult thing I've encountered is capturing teddy's expressions. I've changed muzzle shapes several times until I found the one I'm using right now." The style of shaping is what she calls "bumpy kiss faces." 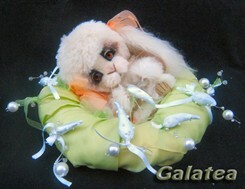 Wires are added to all her "babies" arms which allows them to hug what and who they want. 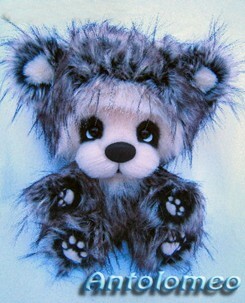 "I should like to hug all the people in the world who like my bears. I don't know what I feel more; being proud of my creations or the tug at my heart when I send them to their new families. Maybe both." Although Annalisa considers herself more a hobbyist than a professional bear maker, she has won several awards which solidify her as a professional. 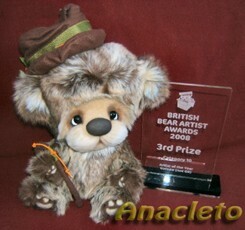 She won third place in her first contest, taking third prize in the 2008 Taiwan Teddy Bear Artist Awards, and coming in second in the British Bear Artists 2008 awards. 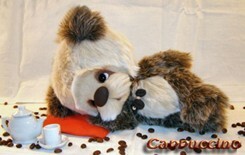 Now with 3 wins with her entries in Bears&Buds' 2009 URSA Awards Competition, Annalisa is firmly rooted in her International appeal. In her heart, Annalisa knows it's all about motherly love. "It’s a matter of fact that I love babies, and I consider all my bears to be my babies; they need their mummy and her protection." And with each of her creations, Annalisa gives a little 'pisa' her heart.